Hi everyone, first time poster here ! 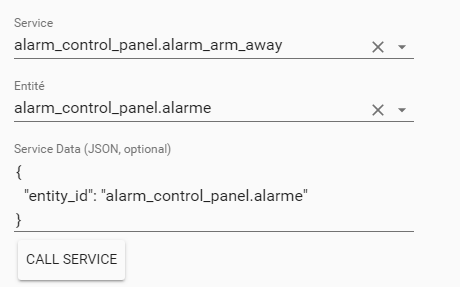 When I click “Call service”, nothing happens. For the sake of my tests, pending time, delay time etc are all at 0. (sorry, can’t post more than one picture). 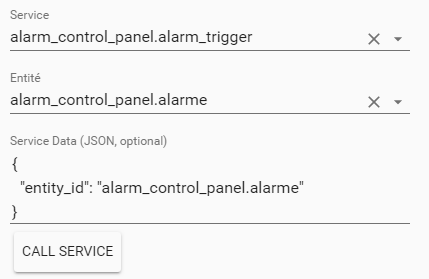 The Set State button actually change the alarm’s state to “Triggered”, and then my automation scenario works, got my pushbullet notification. 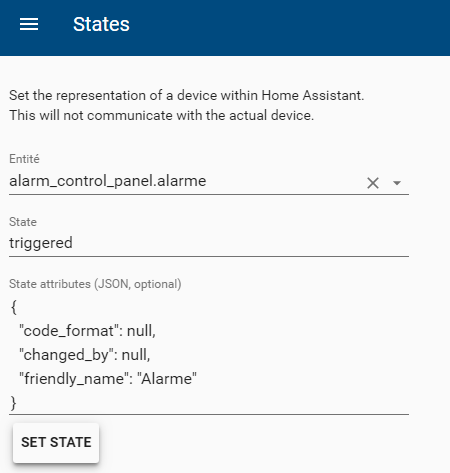 I hope I’ll find a solution, 'cause if not I’ll have to let a note when I’m leaving : “Dear burglar, here is the url of Home Assistant, please log in with this password and set the Alarm state to ‘Triggered’”. Thanks." Hmm, looks like I’m the only one with this problem. I’ll keep digging and will try to update my message if I find something, it might help someone in the future. Ok, found my problem, gonna leave the solution here in case one day someone encounters the same issue. Hey … just wanted to let you know that I had the same issue, and this solved it! It also solve my issue! Thanks!